Michael Albert attended the University of Southern Maine as a Double Performance Major in oboe and voice. He also studied at the Interlochen and Longy Schools of Music. 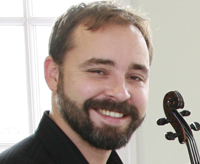 As an oboe soloist, Michael has performed with the Maine Music Society, the Portland and Bangor Symphony Orchestras, the Harvard and Brown University Baroque Orchestras, and the North Shore Philharmonic Orchestra in Massachusetts. Michael has also performed chamber works at various colleges around New England including Wesleyan, Bowdoin, Bates, Colby and Dartmouth.